AirAsia Indonesia (Indonesia AirAsia) (Jakarta) tail section from flight QZ 8501 from the pictured Airbus A320-216 PK-AXC (msn 3648) which was operated on a flight from Surabaya to Singapore with 162 passengers and crew members has been located by divers in the Java Sea. In addition, a section of the fuselage with the aircraft’s PK-AXC registration marks has also been located in the Java Sea. It is now hoped the flight data recorders (not black boxes) will be located near the located tail section. Copyright Photo: Michael B. Ing/AirlinersGallery.com. Airbus A320-216 PK-AXC at Singapore before the tragic accident. This entry was posted in AirAsia (Indonesia) and tagged 3648, A320, A320-200, A320-216, AirAsia, AirAsia (Indonesia), AirAsia flight QZ 8501, Airbus, Airbus A320, Airbus A320-200, flight QZ 8501, Indonesia, Indonesia AirAsia, Java Sea, latest news on AirAsia flight QZ 8501, missing flight QZ 8501, PK-AXC, QZ 8501, tail section on January 7, 2015 by Bruce Drum. 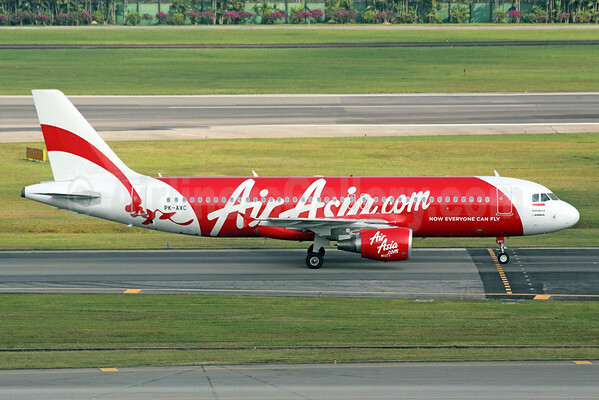 AirAsia Indonesia (Indonesia AirAsia) (part of the AirAsia Group) (Jakarta) missing flight QZ 8501 may have been located. Indonesian searchers battled bad weather today in the Java Sea. The searchers are using sonar and may located the fuselage of Airbus A320-216 PK-AXC possibly with the remaining passengers on board. Divers are trying to reach the possible wreckage but rough seas are hampering the attempts. The debris found yesterday has been confirmed to be from the missing flight. Ten bodies has been recovered that were floating in the water. There were 162 passengers and crew members on the ill-fated flight. AirAsia Group CEO Tony Fernandes told reporters he hoped there was “at least some closure” for families according to CNN. 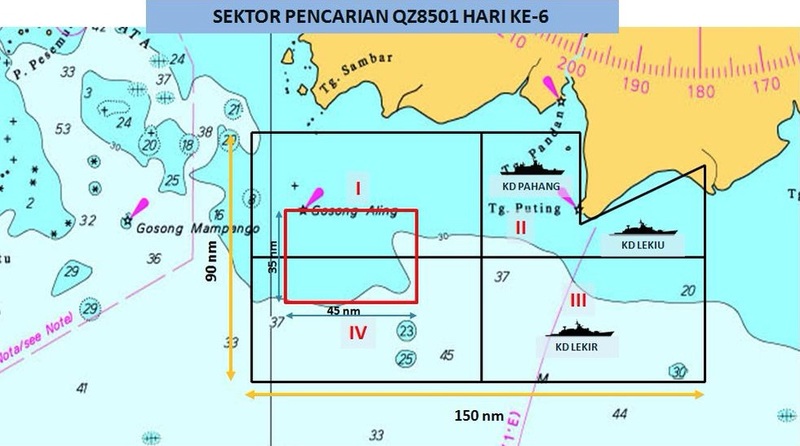 AirAsia Indonesia regrets to inform that The National Search and Rescue Agency Republic of Indonesia (BASARNAS) today confirmed that the debris found earlier today is indeed from QZ 8501, the flight that had lost contact with air traffic control on the morning of 28th December 2014. Copyright Photo: Michael B. Ing/AirlinersGallery.com. Airbus A320-216 PK-AXC (msn 3648) taxies at Singapore before the accident. This entry was posted in AirAsia (Indonesia), AirAsia (Malaysia) and tagged 3648, A320, A320-200, A320-216, AirAsia, AirAsia (Indonesia), AirAsia flight 8501, Airbus, Airbus A320, Airbus A320-200, flight 8501, flight QZ 8501, Java Sea, missing AirAsia Indonesia flight 8501, PK-AXC, QZ 8501 on December 31, 2014 by Bruce Drum. AirAsia Indonesia (Indonesia AirAsia) (Jakarta) missing flight QZ 8501 has now been confirmed to have crashed into the Java Sea. Reuters is reporting at least 40 bodies and debris have been found by ships off the coast of Borneo. Aircraft parts, including a door and oxygen tanks have now been recovered indicating a possible debris field in the water. The main part of Airbus A320-216 PK-AXC (msn 3648) still has not been located. This entry was posted in AirAsia (Indonesia), AirAsia (Malaysia) and tagged AirAsia, AirAsia (Indonesia), debris, flight QZ 8501, Indonesia AirAsia, latest news on AirAsia flight QZ 8501, QZ 8501, Tony Fernandes on December 30, 2014 by Bruce Drum.